GDC-0084 is a potent and selective dual inhibitor of PI3K/mTOR with the ability to penetrate the blood−brain barrier, as it was discovered in Genentech laboratories (Roche group) for the treatment of various brain cancers. Highlights of the synthesis include a phase transfer catalyzed annulation in water, and the last step of the API is the Suzuki-Miyaura cross-coupling of a chloropyrimidine with an arylboronic acid using a palladium catalyst. In this cross-coupling reaction, an initial catalyst screen found PdCl2(dppf)•CH2Cl2 to be superior to PdCl2(PPh3)2, PdCl2(AmPhos), and Pd(OAc)2/SPhos in terms of conversion. A brief solvent screen (entries 4-7) using 2 mol % catalyst showed that aqueous THF was the better system, affording more than 98% conversion after 2 h (scheme). 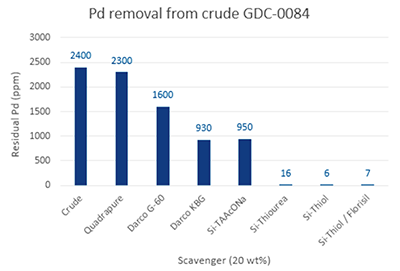 The crude GDC-0084 contained a large amount of residual palladium (≈ 2400 ppm) were exposed to a variety of scavengers (20 wt % loading) in an effort to reduce the level of metal. Both Si-thiol and Si-thiourea were found to lower the residual Pd the most efficiently (figure). The main issues in the stage 2 process were the high catalyst loading (2 mol %, PdCl2(dppf)•CH2Cl2) for the Suzuki coupling and the large total solvent volume (58 vol). The optimized Suzuki cross-coupling was successfully demonstrated to provide 7.49 kg of crude GDC-0084 (94 % yield). Overall, replacing PdCl2(dppf)•CH2Cl2 with Buchwald’s second generation XPhos Pd G2 catalyst enabled the catalyst loading to be lowered from 2 to 0.5 mol %, and the scavenging procedure to be limited to one single SiliaMetS Si-Thiol (instead of both Si-Thiol and Si-Thiourea), and only 10 wt % was sufficient to lower residual Pd to below 10 ppm.